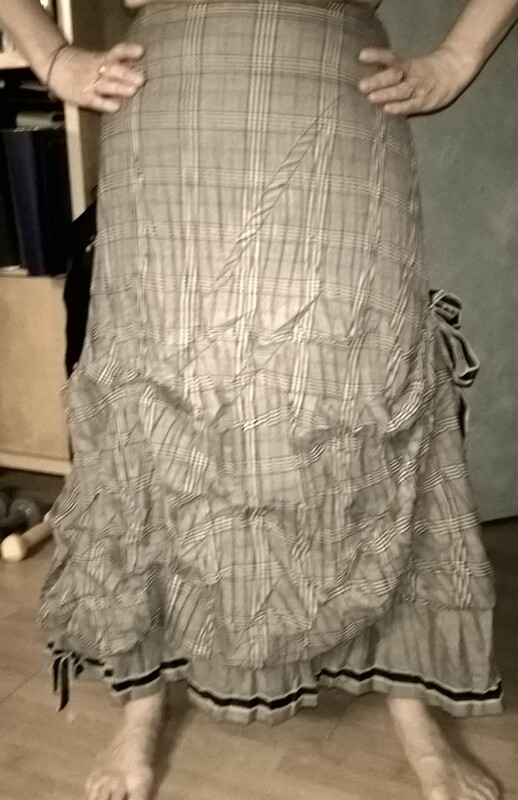 A funky find at Goodwill… a long bubble skirt with a tie on one side. I loved the fabric, crinkle finish, and irregular stitching, forming little drapes. The overall vibe of the skirt was Bohemian, though, which is not a look I can pull off! It looked too small for me, but I was delighted to find I could zip it up (as long as I don’t breathe too deeply or pig out at lunchtime). First thing to do was get rid of some length put some music on…..Winterhead by New Cassettes. OK, second thing to do was get rid of some length. I cut the lining and skirt apart at the hem, to lose the bubble effect, then just kept trying it on, and chopping more off the bottom. I didn’t worry about keeping the hem level, as the crinkles and stitching gave it an uneven hem anyway. I saved the border with the stripe – I’m sure I can find a project that needs that. I overlocked both hems, and done – didn’t even hear the whole CD!